The last leg of my landscape painting road trip was the most exciting part of the journey. I’ve never been to outback NSW. The promise of that red burnt, scorched earthen landscape has enticed me as a painter for many years. So I decided to take myself right out there and immerse in it. Breathe it in. 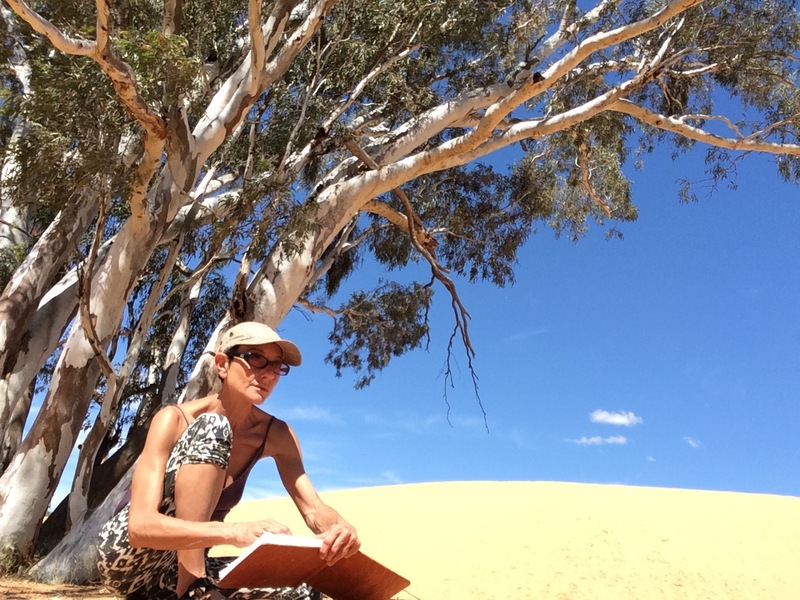 Surround myself with what it means to be truly alone and “outback” in desert country. I set out of Gunning fully armed with a suitcase I called my pharmacy. In it I packed antibiotics, creams, lotions, potions, pills, ointments, antiseptics, probiotics, vitamin supplements, medications, band-aids; pretty much everything I had in our medicine cabinet including extras. I was armed against every conceivable insect bite, bacteria and virus. I wasn’t going outback getting as sick as I did on the first round of my trip. Since beginning my road trip, I had also learned to travel much lighter and smarter. One large dry esky acted as my “pantry”. It was packed with tinned salmon, candles, herbs, oil, spices, coffee, tea, soy milk. The Pantry and the Pharmacy, stayed in the car. I only dipped into them when I needed anything and made sure I replaced items along the way. I would never run out of anything! Another small cold soft esky that was light and I could carry on my shoulder, was for daily use in and out of cabins. Fresh veg, fruit, milk, butter. A towel, pillow, blanket and linen also stayed in the car for those cabins that charge extra for linen, and in the unfortunate event I may have to spend a night in the car. I also streamlined my art materials. I began the first part of my journey with my station wagon full of canvas, easels, oil paints, brushes, solvents, drawing pads, pastels… It was basically everything from my studio packed into boxes and shoved into the back of my car. I didn’t get a chance to use any of it whilst on the road, the only things I used, were pastels, sketch book and postcards. My portable studio did however get a lovely trip around the country. So I managed to pack those few essential items into a lovely old leather satchel I bought in Greece many years ago. Now I could go anywhere and draw anytime. My fantasy of painting whilst on the road, was just that. If I had a place I could have stayed for more than a couple of nights at a time before packing up and driving for miles to the next location, I would have had a chance to settle down and get some serious painting done. This was after all, a road trip. 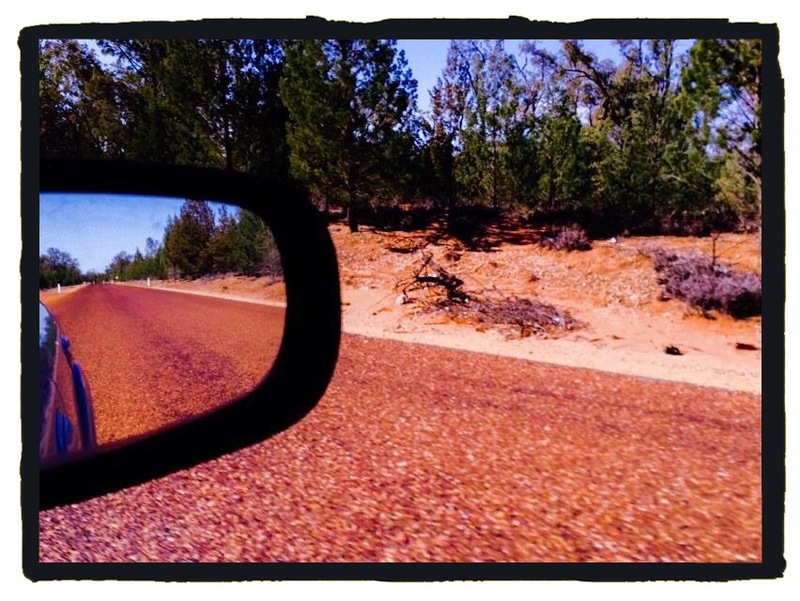 I was “on the road” constantly moving, taking drive-by-shots of the landscape from my car between destinations. These have served me well as sketches for paintings I can produce back in the studio. I loved getting back to my digs after a long dusty drive. Going through all the “drive-by’s” and being thrilled by the wonderful images captured by chance and motion. These images are the epitome of the journey. A soft overnight bag housed basic clothing and toiletries. A small backpack for bush walking. iPad mini for connecting to the world and Facebook updates. iPhone for camera and navigation. Cables. Device chargers. First aid kit for car. First aid kit permanently in backpack. Tissues and toilet paper in car and luggage. Lots of water bottles and one large 15L water container (this came in very handy at Menidee Lakes where water was undrinkable within the cabin). The back seat of the car served as my Winter wardrobe, coats, scarves, jumpers, jackets and beanies in case of cold snaps. Hiking shoes, comfy driving shoes and hiking sandals. Whist driving long distances, I grazed on carrots, celery and apple for alertness and sustained energy. Keeping my eyesight good for spotting wildlife roadkill and road signs. I was still suffering from four badly infected tick bites when I left. A five and a half hour drive was my limit. Fatigue set in quickly, so I would break up my driving time with two 2 and a half hour stints. When you’re on your own, you really have to respect your limitations. Thus fully and concisely packed, I set off on my quest to discover the outback. Leaving Gunning I headed toward Gundagai with my first stopover in Hay. Crossing the Hay Plains was remarkable. All of that endless nothingness, all around forever! The long straight stretch of the Sturt Highway, so long, I could see a shimmering mirage at the end, which was never really the end, there was no end and no beginning. A feeling of immense freedom overcame me on this road. A road from nowhere to nowhere surrounded by flatness. With every mile, my journey gradually became an endless freedom from everything familiar; a journey into nowhereville and a freedom from every “thing”.